Whilst the sell-out of tourist destination is a well known plague all through Italy, there exists a tiny town in UNESCO Heritage Val d'Orcia which forgoes made in China souvenirs and just opened a bookshop instead. Bagno Vignoni is one of Tuscany's oldest tourist destinations. In fact the historic spa town has never been anything else than a tourist destination, and the ratio of inhabitants to visitors must always have been at least 1 to 10. Having looked after medieval pilgrims, ailing popes and saints (St. Catherine of Siena used to live here for a while), Bagno Vignoni isn't tempted at all to put out plastic chairs or pizza takeaways for present day travelers. 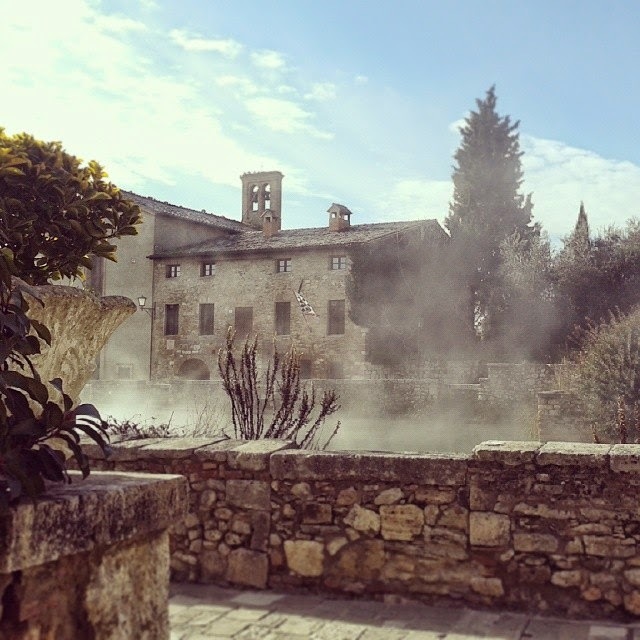 I used to live close to Bagno Vignoni and have fond memories of chasing my first-born around the town's main square which consists of a steaming hot water pool (a must-see sight for urban architects!). Our healthy mornings were usually finished off with a slice of fudge chocolate cake and orange sauce at bar Le Terme. After that, we'd dip our feet in the thermal water in the small stone cut waterways as legions of tired travellers must have done before us through the centuries. It hasn't been possible to swim in the town square's medieval pool for decades (though I happen to know people who've been in there, at night...). 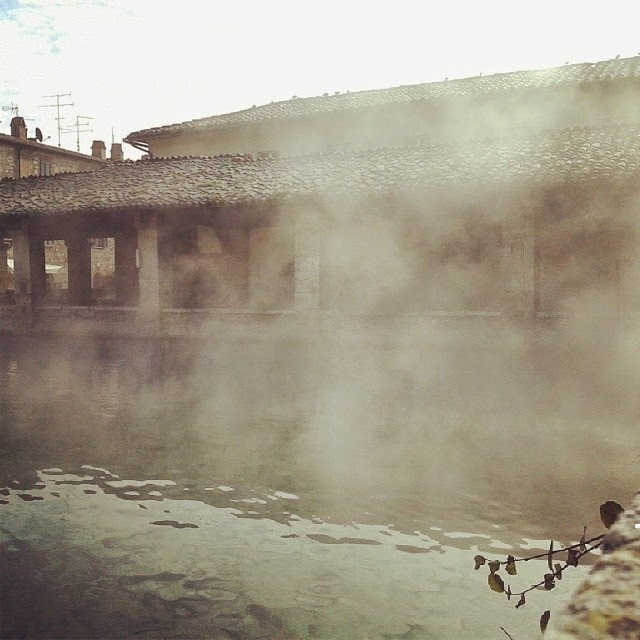 And unlike Tuscany's other wild hot springs, Bagno Vignoni's natural pool down in the valley isn't warm enough for soaking in the winter. 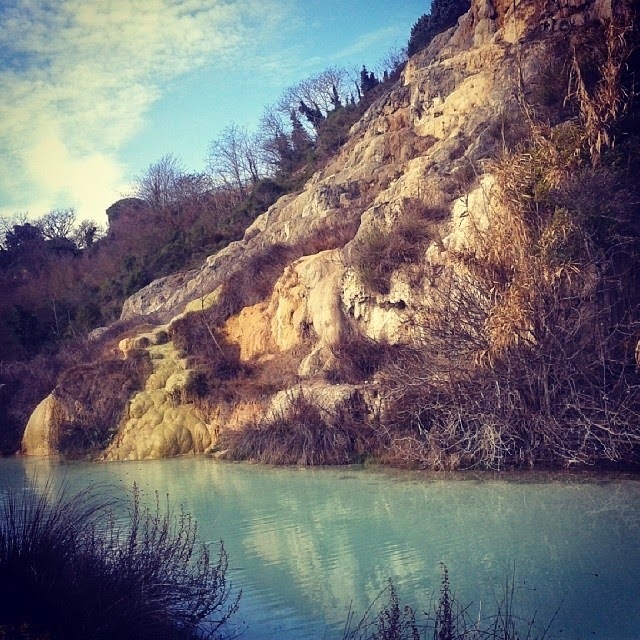 However, the sulfurous pool is a popular place for a free swim in summer. and stays open for late night swims during summer. The pool belongs to Hotel Posta Marcucci, but is accessible with a day-pass (adults 27€, 20€ after 2pm). As in many Italian public pools, you'll have to bring a swim cap or buy one at the entrance. There's a lovely walk connecting Bagno Vignoni with Vignoni Alto, where you can either turn back or hike on towards Castello di Ripa d'Orcia for a signed out round walk which will take you back to Bagno Vignoni (10km). 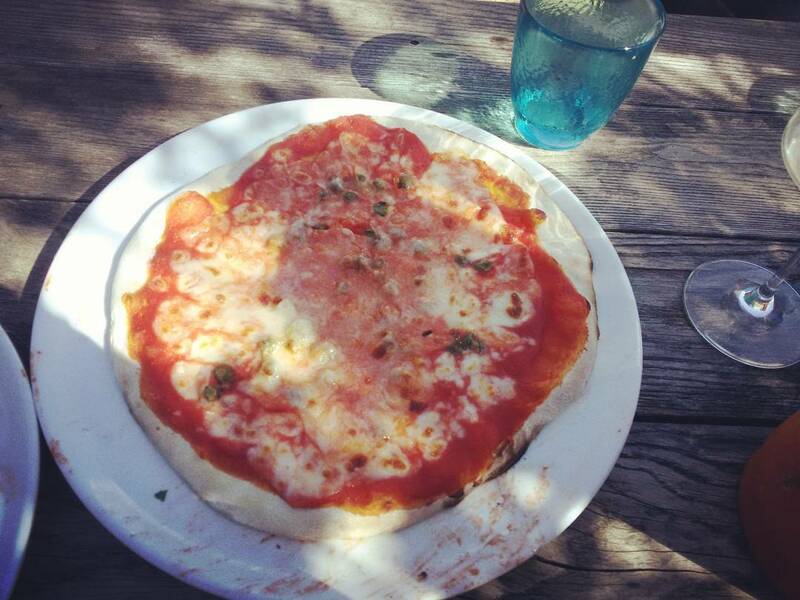 After swim and exercise, you'll need a hearty lunch. With good weather sit outside and make your own selection of Tuscan cold cuts, Pecorino cheese and vegetables at Bottega di Cacio. Next door, Osteria Leone has changed hand a few times during the last decade, so it's hard to say how good the food will be, but it's worth a try for the lovely ambience. 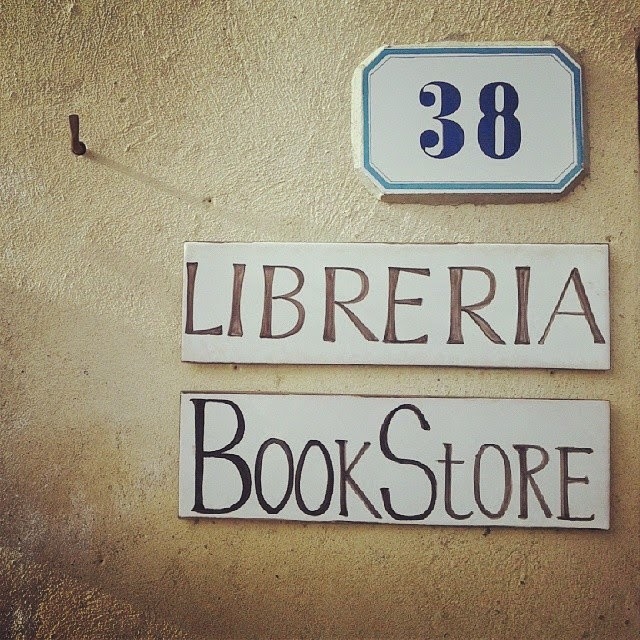 For a digestive walk do a bit of shopping around the square/pool and buy a couple of books at Librorcia (anybody courageous enough to open a bookshop in the 21st century deserves full support). A bit further on Toscana Lovers offers a great selection of Tuscan linens and tableware. 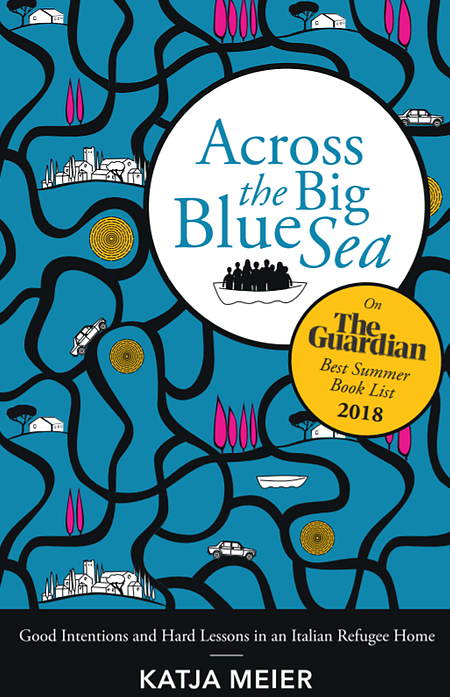 The shop also stocks Across the Big Blue Sea, my book about a refugee home in Tuscany. It's a fast-paced read and entertaining travel companion if you'd like to know what happens behind closed doors in Montalcino, Pienza and other lesser known locations of southern Tuscany. If you're in Bagno Vignoni in the evening check out bar Il Barrino. During high season the bar often hosts jazz concerts. They know how to prepare a good cocktail and have a nice selection of teas. IL LOGGIATO is a lovely B&B run by two Tuscan sisters with plenty of style. If booked up, try hotel Le Terme, which has had a total makeover a few years ago. Staff is friendly and some of the rooms go onto the hot water pool. Close to Bagno Vignoni, hotel Adler Terme is the fanciest sleepover in the area. Personally, I'm not mad about the architecture and interior decoration of the five-star spa resort and style wise prefer the less expensive options right in town (the same counts for hotel Adler's day spa service compared to the less costly entrance to the pool of Val di Sole mentioned above). 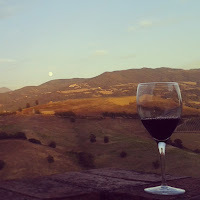 A round trip with a first stop in San Quirico d'Orcia (the municipality Bagno Vignoni belongs too) followed by a Brunello wine tasting in Montalcino. After that sober up with some Gregorian chants at Sant'Antimo abbey. From the Romanesque church drive on towards Monte Amiata Scalo and Castiglion d'Orcia for some fabulous views over the hills of Maremma to the west and Val d'Orcia to the east. Renaissance town Pienza is another must-see but make sure you get the timing right during high-season (early morning or early evening) to avoid tourist rush hour. Looking for more steaming water and bathing pleasures? Check my map of Tuscany's best wilderness pools and historic spa towns. Can't come out? Watch Bagno Vignoni on the screen. 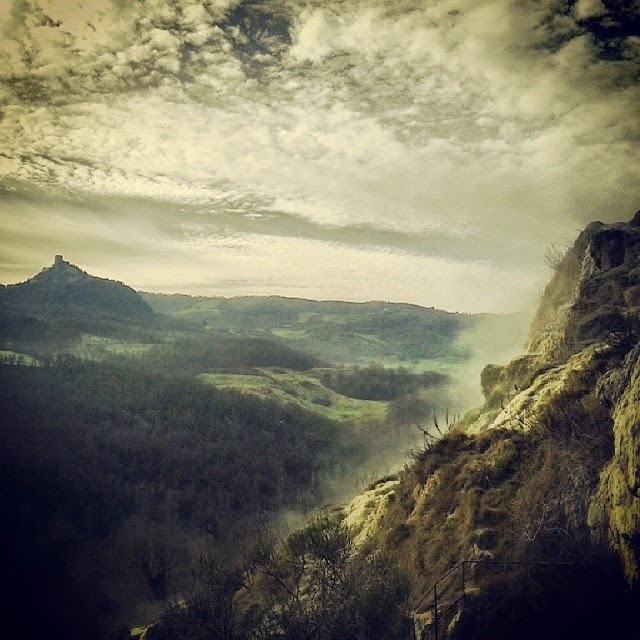 Andrei Tarkowsky has been in Bagno Vignoni to film Nostalghia. And so did Harvey Keitel (Shadows in the Sun).